On November 4, legendary conguero Carlos "Patato" Valdez, celebrated his birthday at a party hosted by Charles Carlini at the world famous Birdland Jazz Club in New York City. Many celebrities, including Candido, Ray Barretto, Dave Valentin, Jimmy Delgado, Edy Martinez, John Walsh, Enrique Fernandez, Oriente Lopez, and Andrea Brachfeld, were there to honor him. The early years of LP® are intertwined with the talents of this great musician. When we met during the 1960�s, Patato took me under his wing, and introduced me to the real world of Afro-Cuban music. With his help, LP created a line of drums. The fiberglass congas were developed in 1978 after a recording session with "Patato" at my home recording studio. Patato's own design required tall drums with a wide belly and small bottom. 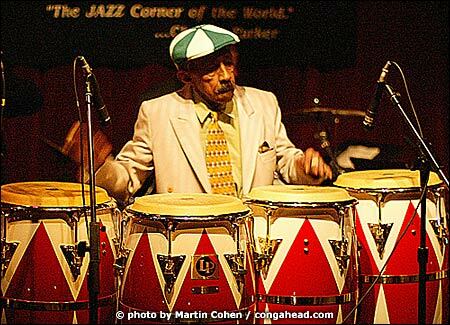 For more information on the LP Patato Model Congas, click here. In 1979, I formed a group with Patato and Tito Puente that toured the world, and introduced many audiences to Latin and Latin Jazz music. Carlos Kanno, of the Japanese band 'Orquesta de la Luz', once told me that this band shaped his musical career. To see a Tribute Gallery and Soundtrack, CLICK HERE.